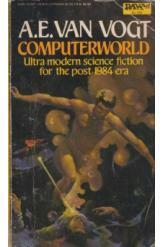 Computerworld by A. E. Van Vogt, Sci Fi. Book is in good condition, all pages intact. In a world completely dominated by an autocratic synthesis of computers and computer engineers, a group of rebels struggle for freedom.